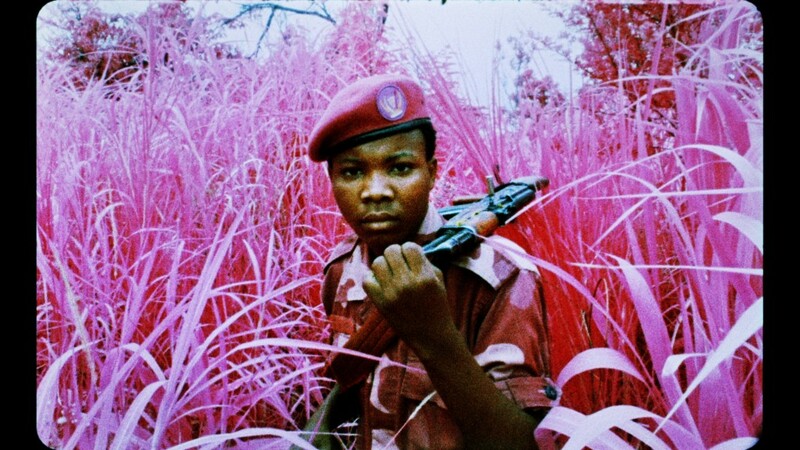 Richard Mosse, Film still from The Enclave, 2012-2013, showing a rebel from Mai Mai Yakutumba posing in Elephant Grass in Fizi, South Kivu, eastern Democratic Republic of Congo, 16 mm infrared film transferred to HD video, 39 minutes 25 seconds, Produced in eastern Democratic Republic of Congo, Director/Producer: Richard Mosse, Cinematographer/Editor: Trevor Tweeten, Composer/Sound Designer: Ben Frost, Courtesy of the artist and Jack Shainman Gallery, New York. The Mercy Corps Action Center and Portland Art Museum have partnered to provide an educational opportunity that examines the ongoing conflict in the Democratic Republic of Congo and the complicated process of Mercy Corps’ community-driven development work. Click here to learn more and take advantage of this unique opportunity that blends art and action. Click here to learn more about Mercy Corps programs in the Democratic Republic of Congo. Click here to access a comprehensive overview and timeline for the Democratic Republic of Congo from the BBC. Richard Mosse Suspicious Minds, 2012 digital c-print 48 x 60 inches – Edition of 2 + AP 28 x 35 inches – Edition of 5 + AP RIM12.024 © Richard Mosse. Courtesy of the artist and Jack Shainman Gallery, New York. Richard Mosse’s powerful video installation The Enclave (2013) premiered at the 2013 Venice Biennale in the Irish Pavilion. The Enclave was produced using a recently discontinued military film technology originally designed in World War II to reveal camouflaged installations hidden in the landscape. This film registers an invisible spectrum of infrared light, rendering the green landscape in vivid hues of lavender, crimson, and hot pink. On the threshold of the medium’s extinction, Mosse employed this film to document an ongoing conflict situation in eastern Democratic Republic of Congo. This humanitarian disaster—in which 5.4 million people have died since 1998—is largely overlooked by the mass media. Frequent massacres, human rights violations, and widespread sexual violence remain unaccounted for. In a kind of advocacy of seeing, The Enclave attempts to cast this forgotten tragedy in a new spectrum of light, to make this forgotten humanitarian disaster visible. The Enclave comprises six monumental double-sided screens installed in a large darkened chamber, creating a physically immersive experience. Several of his monumental photographs from the Democratic Republic of Congo will also be on display. This disorienting and kaleidoscopic installation is intended to formally parallel eastern Congo’s multifaceted conflict, confounding expectations and forcing the viewer to interact spatially from an array of differing viewpoints. Its haunting, visceral soundscape is layered spatially by 12-point surround sound, composed by Ben Frost from recordings gathered in North and South Kivu. The piece took more than a year to produce. It is a looping, non-linear narrative which documents civilians fleeing massacre and Mai Mai militia preparing for battle, as well as M23 rebels moving on, fighting for, and finally taking the city of Goma. This humanitarian disaster unfolds in a landscape of extraordinary beauty, on the shores of Lake Kivu. Mosse was born in Ireland in 1980 and currently lives and works in New York. He earned an MFA in photography from Yale School of Art and a postgraduate diploma in fine art from Goldsmiths in London. In 2014, Mosse was awarded the prestigious Deutsche Börse Photography Prize, and in 2011 received a Guggenheim Fellowship. Foreign Policy Magazine listed him as a Leading Global Thinker of 2013. The Enclave is organized by the Portland Art Museum and curated by Brian Ferriso, The Marilyn H. and Dr. Robert B. Pamplin Jr. Director, and Julia Dolan, Ph.D., The Minor White Curator of Photography. MAJOR SPONSORS: Helen Jo and Bill Whitsell; Mary and Tim Boyle; Jasmin and Matthew Felton; Katherine and James Gentry; and Priscilla Bernard Wieden and Dan Wieden. SPONSORS: Lisa Domenico Brooke; Frank Foti and Brenda Smola; Linda Rae Hickey; Kathleen Lewis; Miller Meigs Endowment for Contemporary Art; The Arnold & Augusta Newman Foundation; The Paul G. Allen Family Foundation; Susan and Jim Winkler; and McGeady Family Foundation. SUPPORTERS: The Lazar Foundation; Debi Coleman; Gun Denhart; Jo Whitsell; Margaret and Roger Hinshaw; and Rosine and Colin Evans. Every gift you make will support our education and outreach efforts and will help enrich the experience for all visitors. Click below to see special rewards for our supporters.